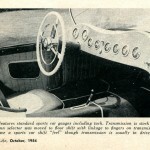 Caption: Cockpit features standard sports car gauges including tach. Transmission is stock Dynaflow, but column selector was moved to floor shift with linkage to fingers on transmission case, which gave a sports car shift "feel" though transmission is usually in drive position. What an interesting time it must have been back in the 1950’s with the birth of modern sports cars. 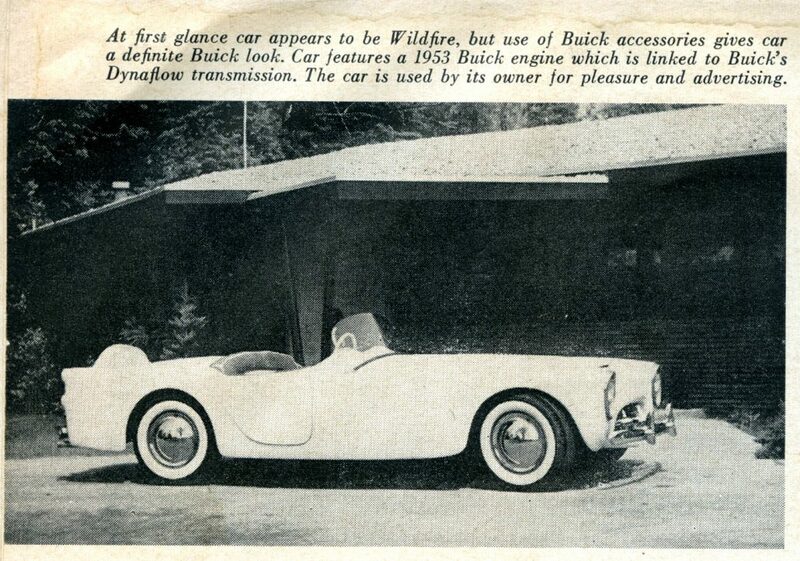 Today’s article focuses on another automotive dealer – this time a Buick dealer – building a fiberglass sports car with components from the cars they are selling new – yearning for their namesake to provide them with a sports car they can sell to an excited, willing, and ready public. We recently talked about the Nash Dealer – Ricker Motors – building a Glasspar G2 with some Nash components – most notably a grille. 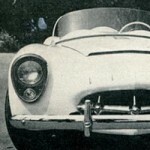 We’ve also talked about two Ford dealers who built Glasspar G2’s they could show off: J.A. Wright of Covington, Virginia and Modern Motors of St. Joseph, Missouri. And of course you can add “Woodill Motors” to this list. 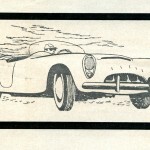 Paul Strassberger of “Strassberg Motors” also “created” a sports car using a G2 body and his intentions were to sell completed cars from his dealership. A number of other companies were also following the lead of those above. When you take what was happening at auto dealers across America into account… you don’t have a trend….you have a phenomenon. 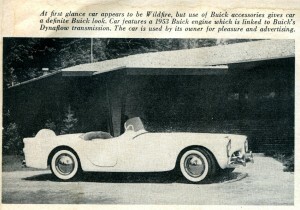 A “coachbuilt” fiberglass sports car phenomenon. And an exciting one to boot! Automotive dealers were taking it on themselves to create their own sports car and sell them from their dealerships. They weren’t trying to sell Glasspar, Wildfire, or other based “specials” to the public. They were branding the car “theirs” with the right mechanicals and outward styling cues, and they were taking these to the streets to advertise, promote, entice, and sell. 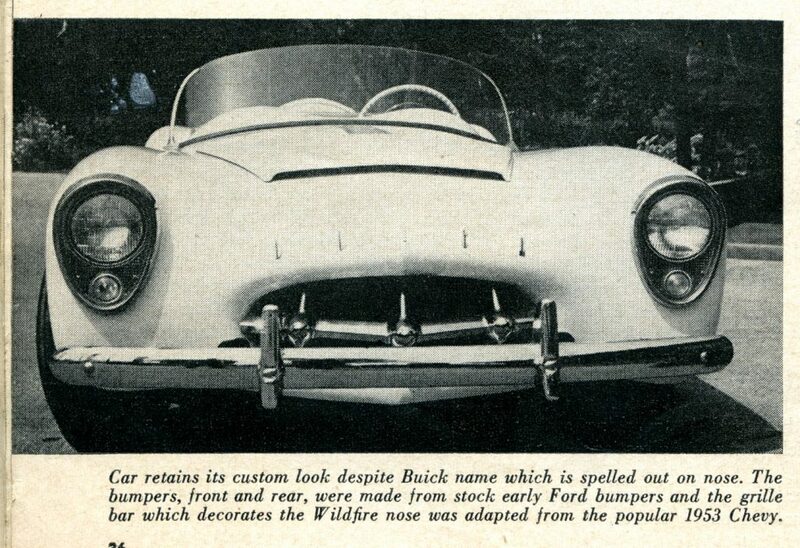 Which leads us to today’s story about a Buick dealer doing the same thing in 1953 – this time creating a “Wildfire-Buick” for his customers to behold. Frank Hecox, Glasspar G2 employee from 1952-1956, was there when the body for this dealership was built, and he discussed this with me during several interviews. 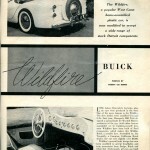 I’ll share Frank’s memories on the building of the “Wildfire-Buick” in future articles here on Forgotten Fiberglass. Caption: To complete Buick identify for advertising use, Willys tail lights were replaced with Buick lights. 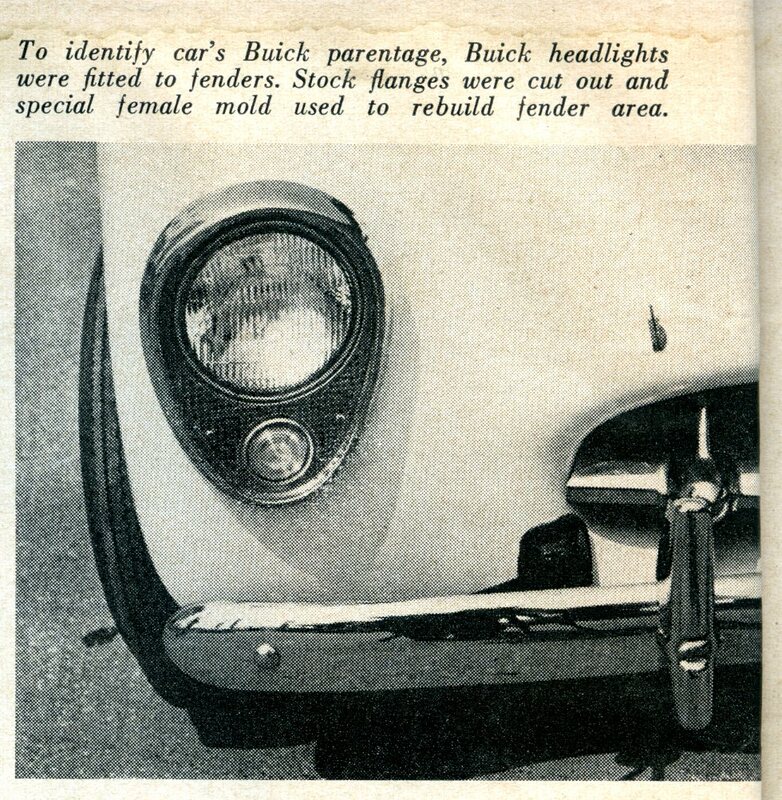 Buick rear fenders served as mock-up for female mold used to form new light tips. 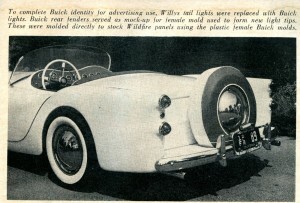 These were molded directly to stock Wildfire panels using the plastic female Buick molds. 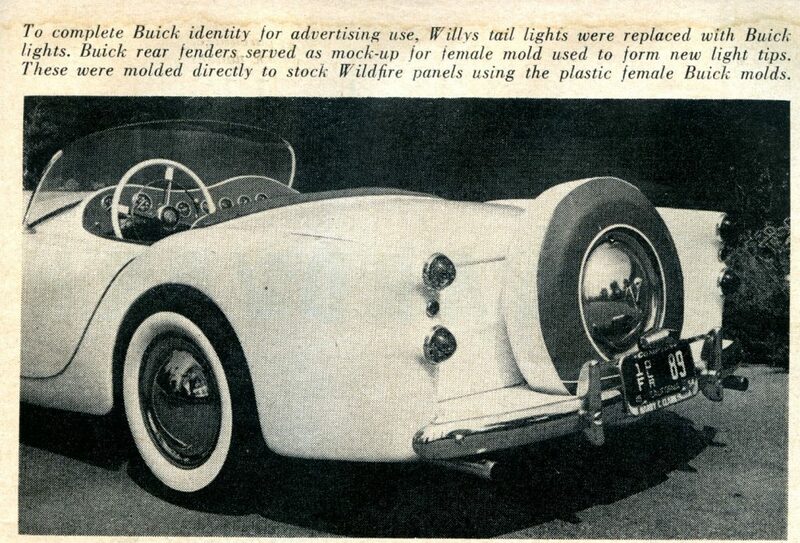 Long before Chevrolet’s Corvette, plastic cars were produced in the west. 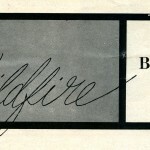 One of the more famous is the Wildfire. The first bodies were modified Glasspar G2’s. 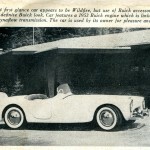 Last year, Glasspar’s Bill Tritt designed a special body for Woodill Motors, producers of the car. Sold either factor assembled or in build-it-yourself kits, most Wildfires have been built of Ford components, which makes this Wildfire Buick a notable first. Assembled by Jim Twombly, a Compton, California Buick dealer, the car cost slightly over $4200. Wildfire’s general body design has now been modified to accept headlights and trim accessories from Dodge, Buick, and Chevrolet. Underneath, all cars are built on a special sports car frame using either transverse leaf springs or independent springs in the fear, for top road handling. I think the auto dealerships in the ‘50s were giving the average car guy a run for their money in building some of these specials. And once you realize this, the chips start to fall into place. Many of the cars we hold precious weren’t just the product of the imagination of young men and their love for automobiles. We can extend this now…..they were also the product of professional teams of individuals who maintained and built cars for a living, and in every way, “coachbuilt” many of the specials we see today at Concours events across the nation. These are some very special cars ….built by extraordinary people during the birth of modern sports cars in America. And we salute their vision and their efforts in our respect for their accomplishments today. 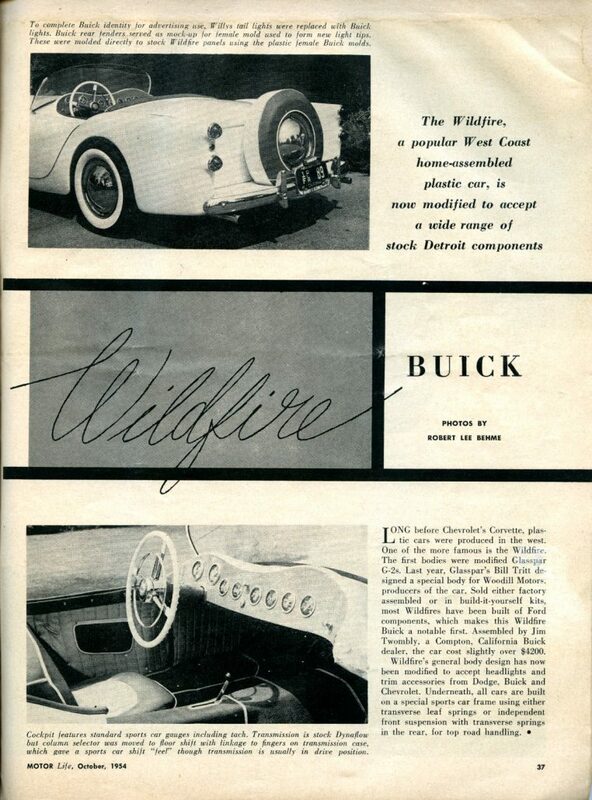 Caption: At first glance car appears to be Wildfire, but use of Buick accessories gives car a definite Buick look. 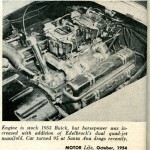 Car features a 1953 Buick engine which is linked to Buick's Dynaflow transmission. The car is used by its owner for pleasure and advertising. 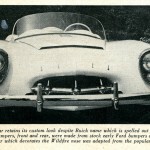 Caption: At first glance car appears to be Wildfire, but use of Buick accessories gives car a definite Buick look. 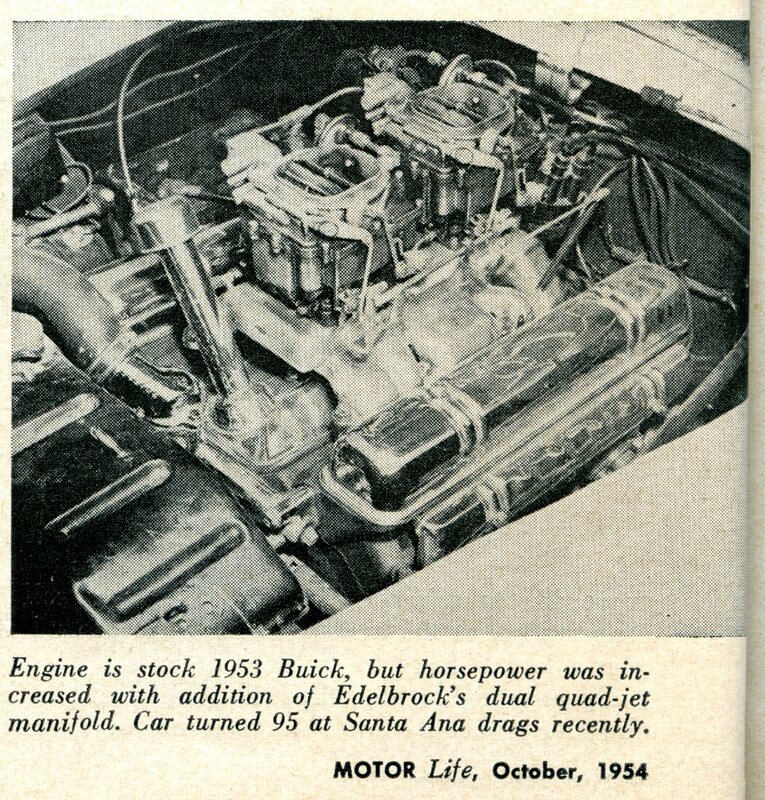 Car features a 1953 Buick engine which is linked to Buick’s Dynaflow transmission. The car is used by its owner for pleasure and advertising. 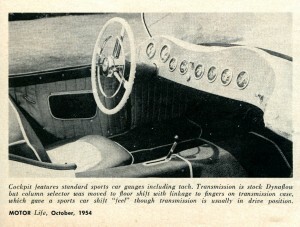 Caption: Cockpit features standard sports car gauges including tach. Transmission is stock Dynaflow, but column selector was moved to floor shift with linkage to fingers on transmission case, which gave a sports car shift “feel” though transmission is usually in drive position. Once again Forgotten Fiberglass is providing the test of concept for the larger story of the emergence of the American Sports car, post World War 11. 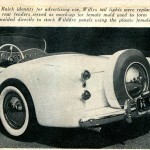 Dealerships, the focus of this article, saw the demand for American built sports cars. 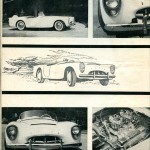 You have documented many times individual efforts to build sports cars. Meeting an unmet need in the market place for American built sports cars crosses the spectrum from the unskilled builder; to the pro individual builder; to the pro dealership. 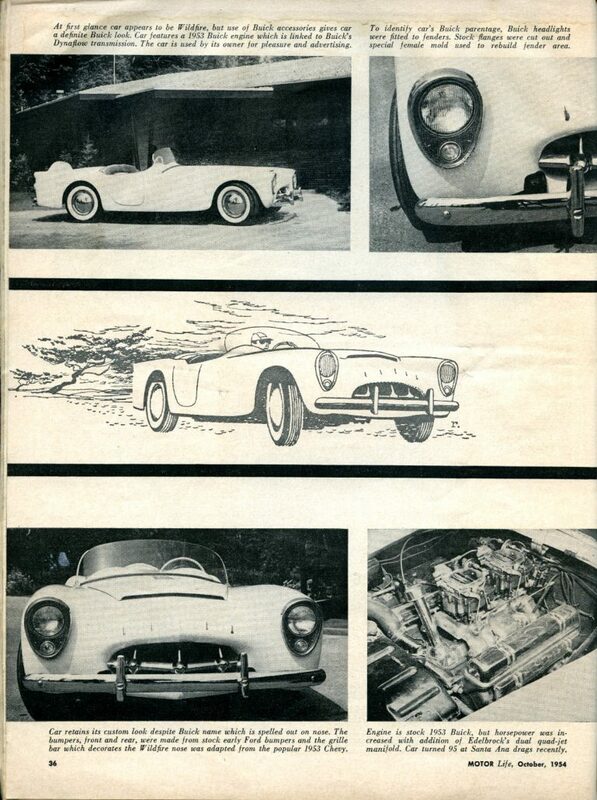 Fiberglass as a material was and still is a perfect material for small production sports and race car bodies. 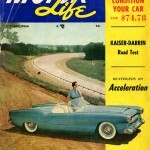 In the early 1950’s car magazines focused on specialty sports cars. This focus was not because they were dealing with a kit car market. The focus represented the way that post war American sports cars were being built to meet an unmet need. This was the sports car landscape in the early 1950’s and magazines were writing about what was then common practices in sports car building. Looking back now, we explaining that rare and odd cars from the 1950’s were central to the evolution of the America sports car post World War 11. Interesting car, and I don’t recall seeing it back when. The Buick engine was a great choice for a sporty car, and the Buick headlights and taillights do give it a little boost in identity. 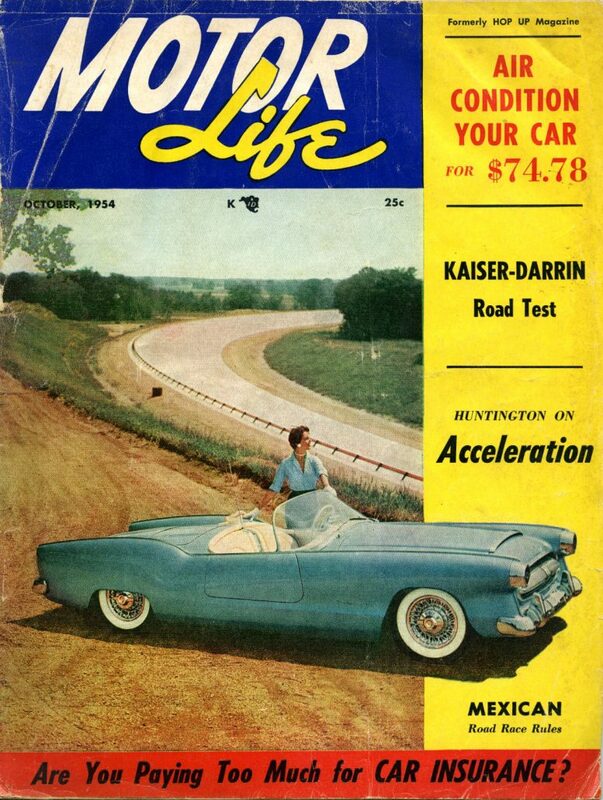 Too bad it didn’t have a 4-speed — they didn’t happen among American cars until the ’57 Corvette — but they should ABSOLUTELY have used the beautiful ’53 Skylark wire wheels. They looked sporty, had a definite Buick identity, and were available from the Buick parts department! They could have left the Chevy grille bars out of the radiator opening, and the appearance would actually have improved.